“As software giant Microsoft is warning of continued economic hardship after its first round of layoffs ever, the company’s chief executive is eyeing competition from Apple, Linux, and Google on the desktop while downplaying the market strength of the iPhone and other opponents of its Windows Mobile operating system,” Zach Spear reports for AppleInsider. “‘The truth of the matter is all the consumer market mojo is with Apple and to a lesser extent BlackBerry,’ he said. 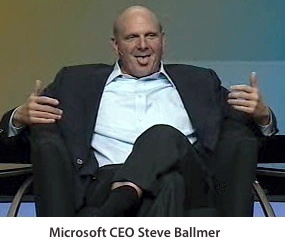 ‘And yet, the real market momentum with operators and the real market momentum with device manufacturers seems to primarily be with Windows Mobile and Android.’ Ballmer’s company made similar comments as it worked to promote PlaysForSure as an industry coalition in competition with Apple’s iPod,” Spear reports. “Last week Microsoft previewed Windows Mobile 6.5, which won’t ship until the end of the year. The company plans to launch Windows Mobile 7, which was originally intended to have already shipped by now, sometime next year.